I started my Locket collection in 2007. From that first locket they have grown into a collection - slowly as inspirations come into my life and a new one is added to the collection. 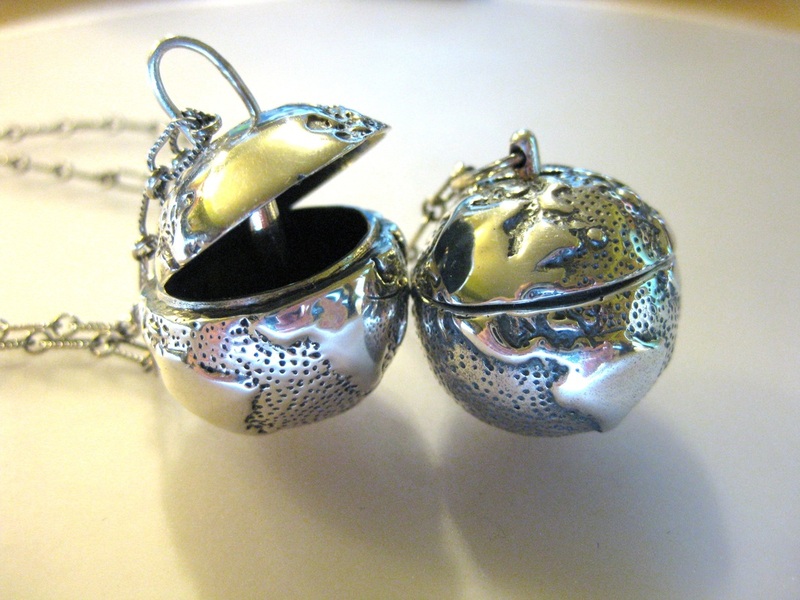 The Lockets provide a place to give words and a symbol to intentions, and bring a focus to daily life. If this is your first time looking at the lockets scroll through them all and see if there is one that speaks to where you are in your life right now. 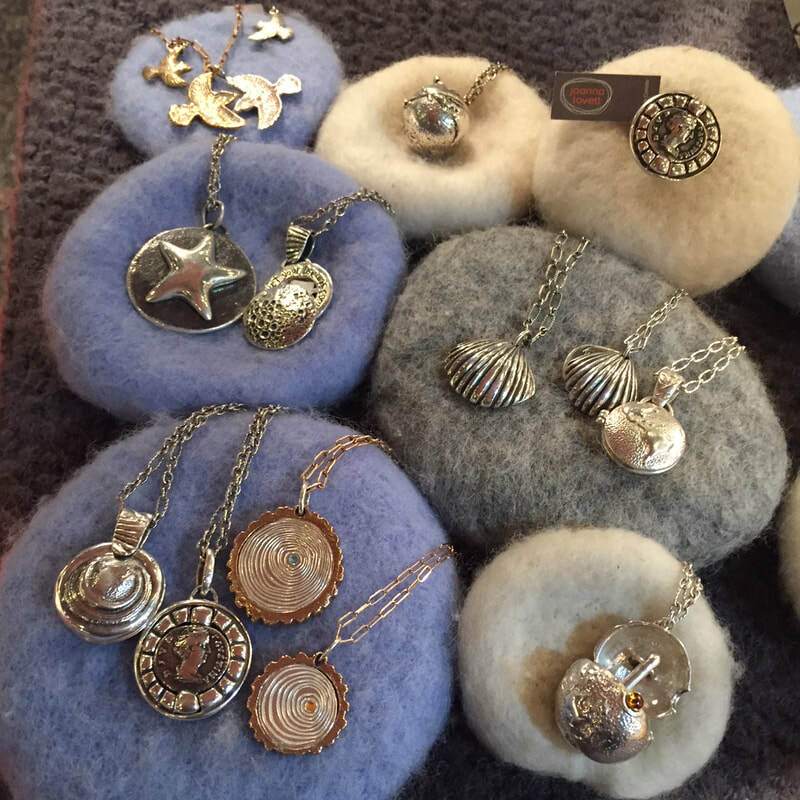 Or if you are thinking of a locket as a gift for someone you love, think of which one would be best suited for where they are in their journey. Any words on the lockets are private, meant to be seen only by the person who wears them. Each one also has a pocket or a slot to include personal words or symbols. The Lockets are also numbered. I have kept track of where each locket travels off to, and it is inspiring to see how they end up all over the world. It seems that all intentions to contribute, big or small, have an impact. Those areas of impact connect to form the earth's community. 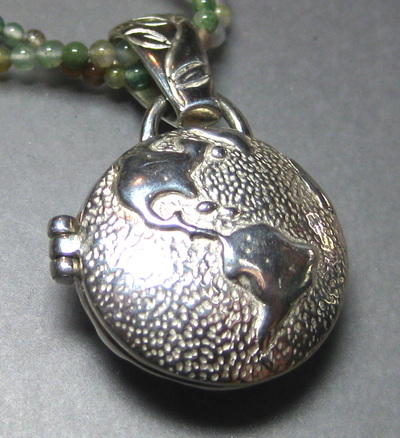 The Earth Locket gives a place to note your personal relationship with the world. ​I chose the image of the earth, shifting the traditional global view to include a peek of Africa on the same side as the Americas. This deviation from the standard, western-centered projection of the earth serves for me as a reminder of our global connectedness. I engraved the image of a vine into the bale, this to celebrate the vibrancy and resourcefulness of all the living things that make our planet what it is. 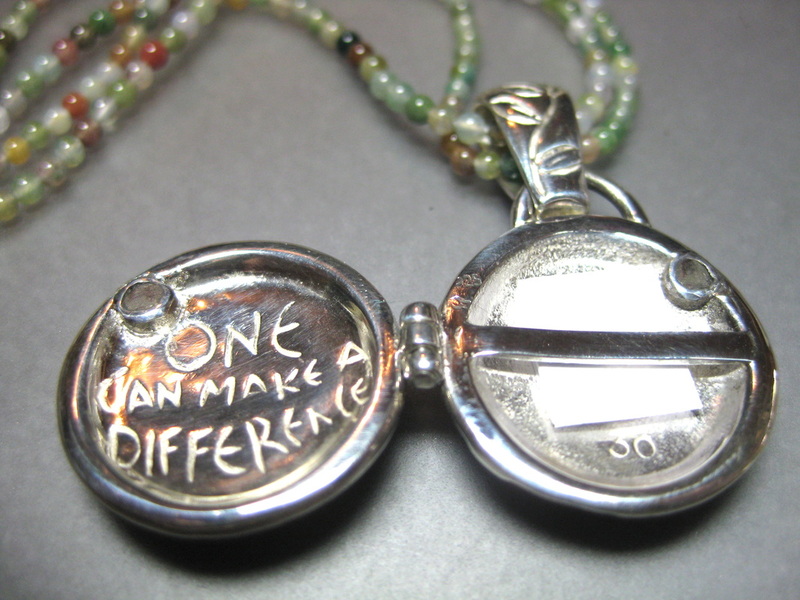 “ONE CAN MAKE A DIFFERENCE” There is also a place for a note to yourself about the difference you would like to make to the world. The night sky is often something we often take for granted, but there is endless wonder to be gained from gazing up at the moon on a clear night. The Dream Locket was born out of my reconnection with the sky on my nighttime bicycle rides. 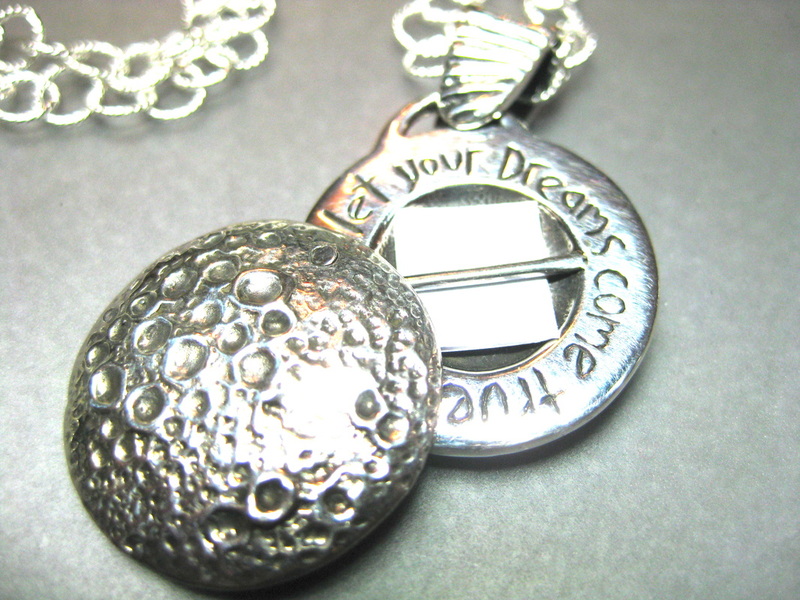 This locket has pockets inside that can safely hold your dreams and is clasped tight with rare earth magnets. 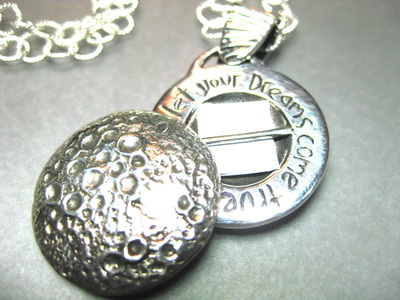 The inscription reads “Let your dreams come true”. For myself, the ocean often acts as a catalyst for my muse. It is something I experience with a mix of joy and apprehension as new inspiration often has two sides, two elements between which I must make a choice. The Muse Locket acts as a stepping stone, an interim repository for those insistent bursts of creativity while you mull them over in your mind and spirit. The two sides of the locket, each with their separate pocket, represent places to store the, sometimes conflicting, facets of your muse. When I met Kim Hudson, author of The Virgin's Promise, I was introduced to the idea of archetypes. These are like human instincts towards growth that exist in our unconscious. Kim’s book describes the journey to fulfill your un-lived potential, ‘your promise’. It is a journey driven by the pursuit of joy. I was inspired to create this locket which mades a space to record a sense of who you truly are and how you would like that to come to life. 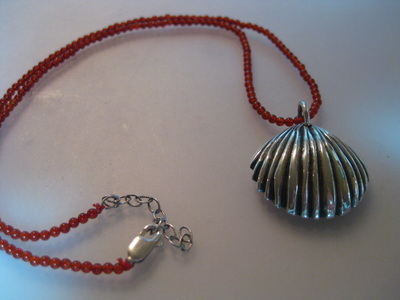 The shell shape of the locket is inspired by Botticelli's Birth of Venus, also on the cover of Kim’s book. 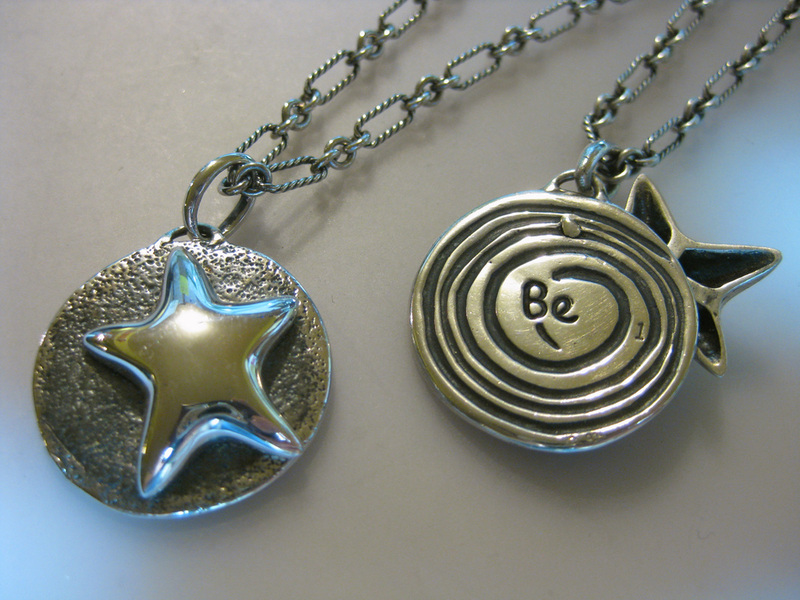 The sides of the locket make a soft encouraging clapper sound when you move. The words "Know thyself be thyself" are inscribed within next to a secret pocket for a personal message. The note is secured with two bars that appear to be dancing, the point where they cross represents the intersection of knowing and being. 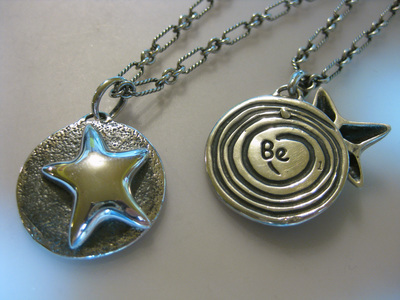 The Starfish Locket design came to be with the help of a story told by a friend about her experience at a silent seaside retreat. Through her long contemplation of starfish, she learned that what she once had thought were static beings, were actually fascinating, active individuals simply operating on a different time scale from herself. I think life can be like this. If we expect things to happen quickly it can appear as if no progress is made, if you really pay attention there are so many marvellous things going on. With this awareness you can be truly centred in your life. I wore this locket while I was on a solo trip in Europe. With no one else to rely on, my internal reference became so important. I found when I paid attention to all the little moments my experience was rich and engaging. I made the starfish able to slide on the rock, even though passers-by may think it is fixed. There is a pocket for a note or a special object. I tucked in fragrant thyme while in Italy. The side of the rock that lays next to your heart chakra is meant to be seen only by you. A line spirals towards the word Be. The path towards yourself is rarely straight, you just have to believe you are where you need to be. The Our Planet Locket was inspired by the giant suspended globe in the central lobby of our new Vancouver Convention Centre. I had many chances to stand below and gaze up at it when I was showing my work at the Circle Craft Summer show on the Plaza. It made me really think about where we all live. 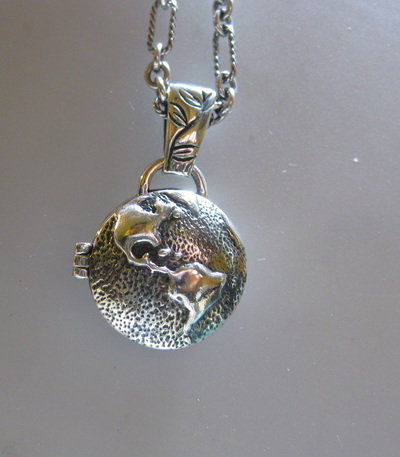 Like that globe, my Locket is in the image of our planet earth, it is made of silver, opens along the tropics and clicks closed at Hawaii. Planet earth is our home, and it is for all of us to care for and share. What in life do you treasure? When I really thought about this I found that unless I focused on them there was a chance that what was most important could get lost in the intensity of daily life. 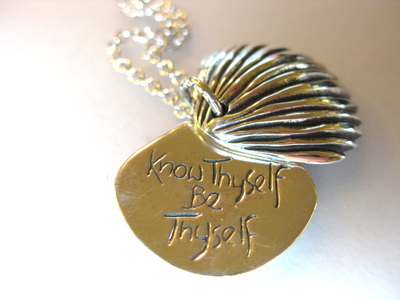 With these thoughts in mind I made this locket. The design of the Treasured locket was influenced by my recent wandering through Pompeii. That peak into the past resonates for me things that are treasured. 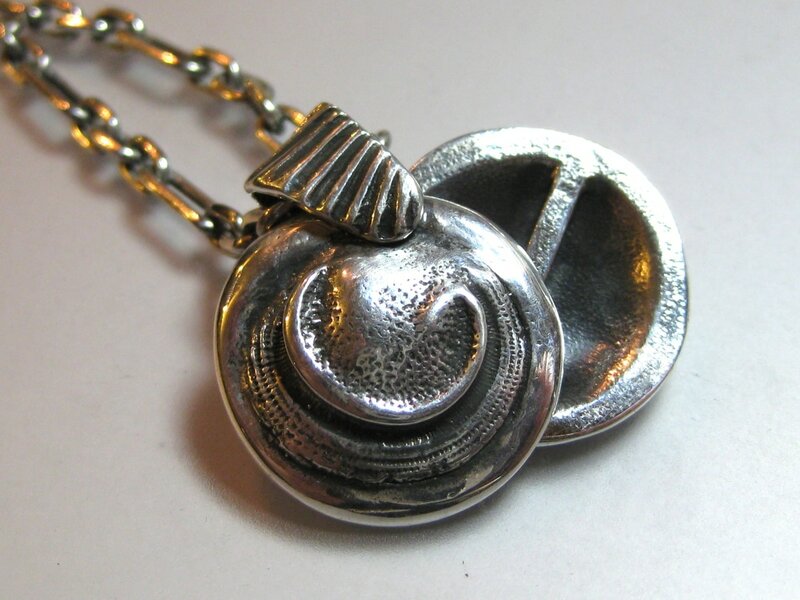 In the centre of the locket is a replica of a Roman coin. 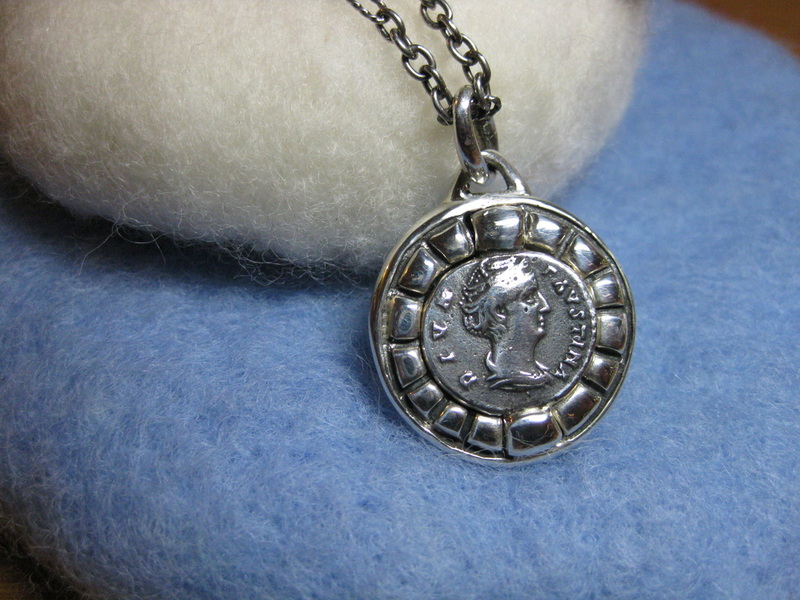 The locket can be made with the replica of the coin of Faustina the younger or her husband Marcus Aurelius. I was excited to buy original coins which were made in silver around 125-175 AD and the more I learnt about these two ancient Romans the more I admired how they often went against conventional ways to seek out what in life there is to be truly treasured. The Locket flips open with a press of a hidden button and contains a slot to hold a note or token of inspiration. I make the Treasured locket as a pendant or as a ring. There is a slot inside to hold a note as a reminder of what it is you treasure . The top holds shut tight with a rare earth magnet. We all have colours inside that are often hidden beneath the exterior that we show the world. The making of this locket was inspired by a story written by my daughter about these unseen aspects of ourselves and others. The story describes the joy of getting to know people for who they are inside. My daughter painted the words of the story on her window sill in her teenage years and when I found them there, I knew that someday this story would inspire a locket. The story talks about sparrows. Like our outward selves, their ordinary feathers can conceal any number of wonders. 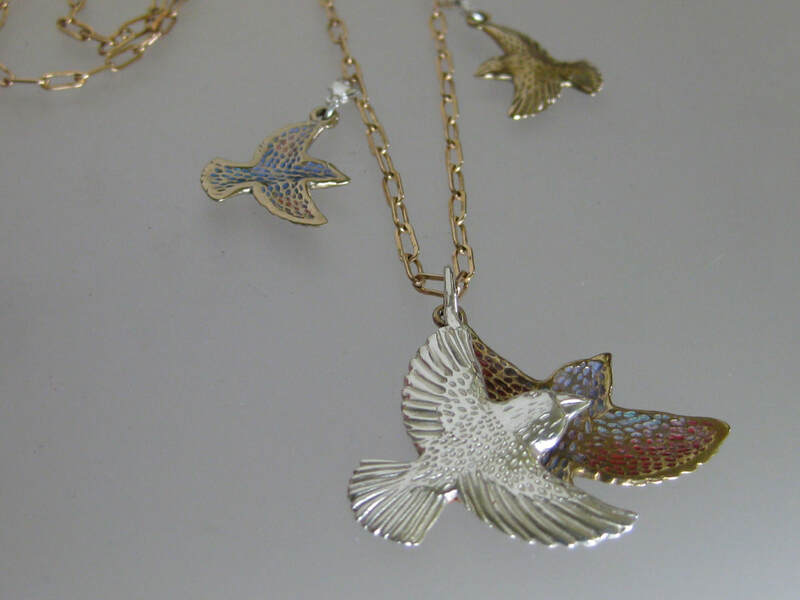 In line with this idea, the locket has taken the form of two sparrows in flight. The colours are only revealed when you take the time to look inside. When I was designing the lockets I had thought of putting a slot inside to hold a note on which you could record your intentions, but the more I wore it, I came to realize that I needed to leave it open as life can be unpredictable and original intentions often get tested. ​Often it is through giving that we truly grow in our lives. When that giving is received mindfully it allows receivers to blossom and so the cycle continues. The “Give and Grow locket” celebrates that growth. 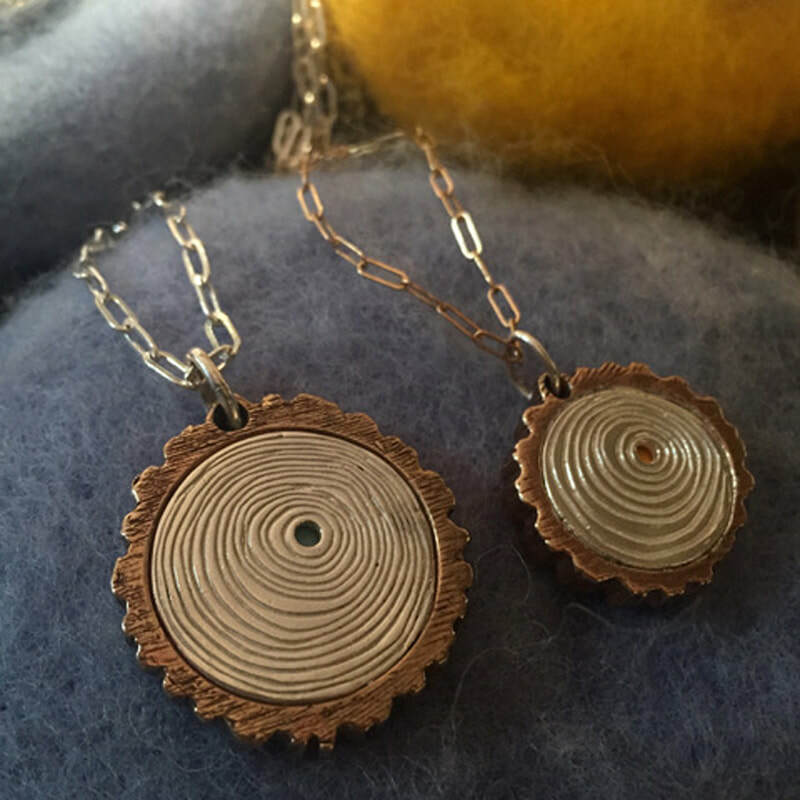 The design of the locket is inspired by the growth rings of the oak tree, a symbol of wisdom and perseverance. Like a tree who grows in at it’s own pace there are times in our lives when we are the ready to give and times when it is important also to receive. The opening in the centre speaks to the power of vunerability - exposing a hint of your note of thanks to someone who has given to you or of your source of mindful giving. A coin on the back holds your note in place inside the locket. 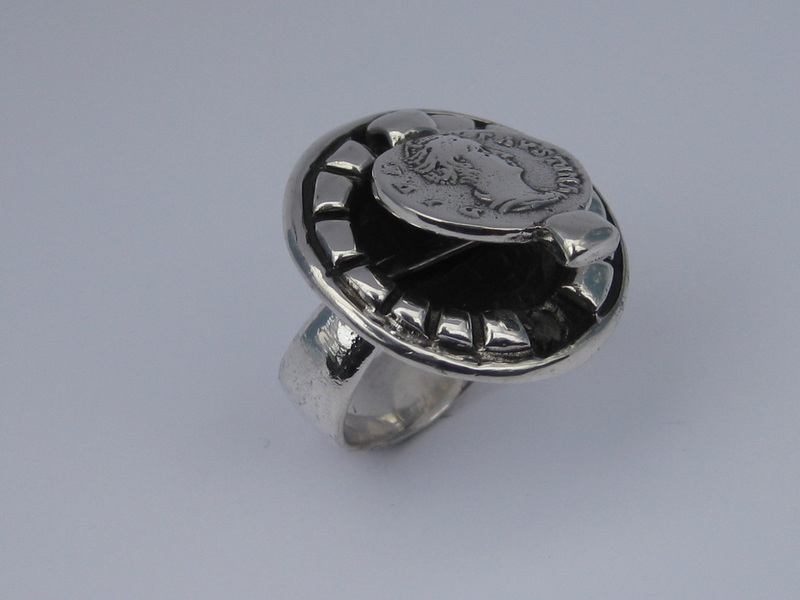 The coin symbolizes the carefully thought out giving of your resources which in turn allow others to find strength and ultimately be able to grow and give in their lives. 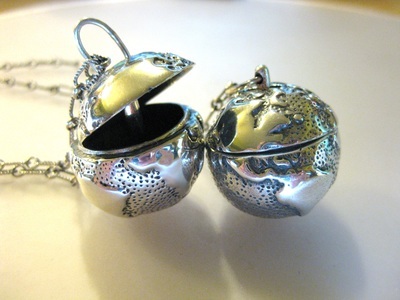 Please send me an e-mail directly if you have any questions regarding the lockets or come to see them at my next show! If you are in the Vancouver area you can shop for them in the Vancouver Art Gallery shop they try to keep one of each version in stock. All the lockets above are all sterling silver, except for the Hidden Colours Locket and the Give and Grow Locket which is half bronze half silver lockets the prices of the Lockets varies based on the complexity of the design and ranges from $140 to $360 and + if you would like the additions of precious or semi-precious stones or custom chains.